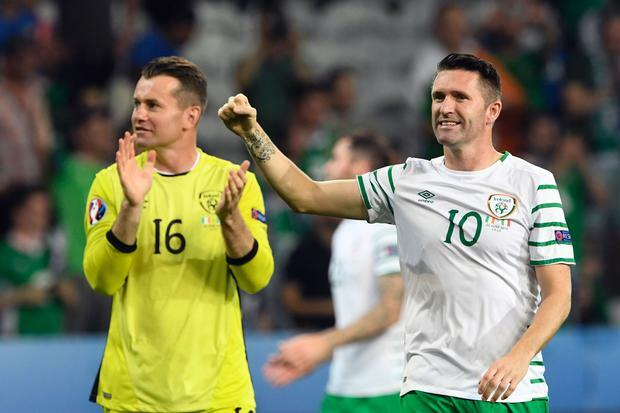 Robbie Keane congratulated his friend and former Ireland international teammate Shay Given on a 'wonderful' career after the goalkeeper appeared on the Ray D'Arcy Show on Saturday night. Given retired from international football in 2016 after 20 years with the Irish national team, and while he has yet to officially announce his retirement from club football, he has started to appear more regularly as a football pundit as he continues to court offers from clubs. Keane, who played alongside Given for 19 years with Ireland, said that the 41-year-old was the best goalkeeper he's ever played with and that it was an absolute joy to play alongside him. "I just wanted to send you a little message, firstly to congratulate you on an absolute wonderful career. I had the pleasure of playing with you for 19 of those in the green jersey. "It was an absolute joy, your professionalism, the way you trained, your hard work and that's why you're the goalkeeper that you were, definitely the best I've played with, and not just that, but such a good friend also. "Delighted with your new book, it's a great read, and there's a couple of pages in there for myself, so probably even a better read now. "Listen, I just wanted to wish you well pal and I'm sure you'll have a great evening and wishing everyone back home and Ray all the best, see you soon, take care, bye bye." An emotional Given also paid tribute to his father Seamus for raising him and his five siblings after the death of his mum. Given was only four and the fifth of six children under 11 when his mother, Agnes, died of lung cancer in 1981. Aunts and uncles offered to take some of the kids on after the family tragedy but Given revealed how his dad stayed through to his promise to her not to split up the family.